The complete range of Centriforce underground cable covers for protecting LV, HV, 11kV, 22kV, 33kV, fibre optic, street lighting and utility power cables. Centriforce Centritile Tape Tile and Stokbord Cable Covers reduce risk of injury and electricity supply interruption with low cost and quick installation to protect underground low voltage and high voltage power cables. Centriforce Stokbord Cable Covers and Centritile Tape Tile provides underground utility protection for power cables, fibre optic cables, gas mains, water mains and pipes. Cable protection tiles and cable covers are installed over underground cables and ducted installations - high visibility Centritile Tape Tile and Stokbord Cable Covers provide visual warning of danger during trench excavations. Cable protection tapes, cable tiles and cable covers protect underground cables (buried services) and ducts, however regional DNO specifications do vary. Typically LV service, LV mains, 11kV and 22kV cables are protected using Centritile Tape Tile while high voltage distribution cables (33kV, 66kV and 132kV) are protected using Stokbord cable covers. 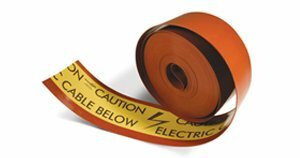 Centriforce Centritile warning tape (Tape Tile) is compliant to ENATS 12-23 for multi-utility underground cable and pipe protection including Electricity, Fibre Optic, Gas, Water. Centritile cable warning and protection rolls (Tape Tile) are rolled out into the trench for quick and easy protection of low voltage, high voltage (up to 11kV), street lighting, telecoms and fibre optic cables - also suitable for underground gas and water pipe protection. Custom printed underground cable warning Tape Tile for low and high voltage power cable protection is available to all DNO specifications - Scottish Power (SP Energy Networks), NIE, ENW (Electricity North West), Western Power Distribution, SSE Power Distribution, Northern Powergrid and UK Power Networks including 33kV Tile Tape (9mm thick). Centritile cable protection is populary referred to as "tape tile" or "cable tile". Centriforce Stokbord underground cable protection covers are heavy duty cable protection covers designed to withstand damage and protect HV cables from plant and hand tools - suitable for underground high voltage cable protection (22kV, 33kV, 66kV, 132kV and up to 400kV). Stokbord cable covers are fully jointed, laid overlapped and connected with plastic jointing pegs to provide safe high voltage underground cable protection. Stokbord cable covers feature a red background with yellow top tape containing visible warning "Caution Electric Cable Below". Stokbord cable covers meet BS2482 impact requirements for underground cable cover protection. Concrete cable covers are used by utilities and cable laying contractors to provide a warning to personnel working or excavating in close proximity to underground pipes or live cables. Various type of concrete cable marker posts are available including Type 2, Tombstone and Duct Marker posts.